PBS KIDS Sprout, the first and only 24-hour preschool destination available on TV, on demand and online for kids ages 2-5 and their parents and caregivers, is launching the award-winning preschool series The Hoobs on December 25 with a "Happy Hooby Holidays" marathon from noon – 6 p.m. EST, marking the series' U.S. television debut. The Hoobs' Tula and Groove will appear on-air as the special guest hosts for the marathon, as they are introduced to the world of Sprout where parents and "tiddlypeeps" (the Hooby word for children) interact, learn and discover new ideas together. Created by The Jim Henson Company and licensed by HIT Entertainment, The Hoobs was Britain's largest ever commission of a preschool show from an independent producer when it launched in the UK in 2000. Set in the sunny, colorful Hoobland, The Hoobs are great explorers who learn about planet Earth by posing different questions to all the children that they encounter along the way. In each episode, they try to find the answer to a question which they put into the great Hoobopaedia created by Hubba Hubba Hoob back in Hoobland. 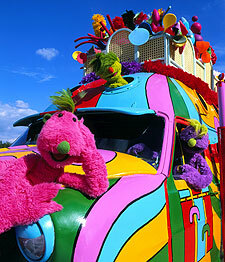 The four main Hoobs – Tula, Groove, Iver and Roma – live in the Hoobmobile and travel to all parts of the world in their quest for discovery and learning. "The Hoobs' passion for knowledge is contagious," said Andrew Beecham, senior vice president of programming, PBS KIDS Sprout. "This age group is all about learning and discovery, and The Hoobs encourage preschoolers to ask questions, explore new ideas, think creatively and communicate with confidence." Lisa Henson, co-CEO of The Jim Henson Company, said, "The Hoobs is a great example of our company's philosophy to create educational programming that is entertaining and engaging for children as well as parents. Young audiences around the world have enjoyed learning about the power of being curious from The Hoobs and we're thrilled to introduce them to U.S. audiences through PBS KIDS Sprout." Following the December 25 launch, The Hoobs will air every day at 2:00 p.m. EST in its regular time slot. Viewers can also ring in the New Year with The Hoobs when the "Happy Hooby Holidays" marathon repeats on Sunday, January 1 from noon – 6:00 p.m. EST. 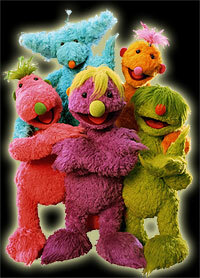 For more information on The Hoobs and other Sprout programs, go to www.sproutonline.com.